© 2000 Ove Långe Vikingship site (All material on this website). >> The first two days of test sailing. [ Dingy-SM in Vänersborg 1998 ] >> Sigrid Storråda (which I was on board), together with Vidfamne and Starkodder visited my hometown - Vänersborg in the summer of 1998. >> Storys from the ship and the journeys. [ The Sail ] >> Construction of a Viking sail. [ Rowing ] >> How to row a Vikingship. [ Sailing ] >> How to sail a Vikingship. 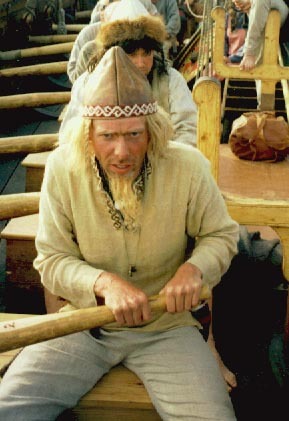 >> About the Gokstad ship, the grave och chiftain Olof Hvite. >> A Map of the rigg. Report part no 3 is my final report after ending my part as a consultant to the construction team. [ The Ship ] >> About the Ship and the construction. [ Data ] >> Data about the ship. "The Society of the Vikingship Sigrid Storråda"